Health and cleaning supplies required as often as learning tools. Lists are growing and parent and school budgets are tighter than ever. The numbers are in: the cost of the average elementary back-to-school supply list in 2015 is $70.93. According to TeacherLists, the smarter way to manage, share and find school supply lists, one of the factors driving the increase in back-to-school spending is the addition of health and cleaning supplies like tissues and hand sanitizer to lists traditionally filled with pens, glue sticks and notebooks. With school budgets tighter than ever and teachers being asked to do more with less, parents are being called on to contribute more during the back-to-school season. Per Teacherlists, school supply lists increasingly include non-learning supplies alongside education tools. Items like facial tissues, disinfectant wipes, hand wipes and hand sanitizer are among the top items requested on teacher wish lists in 2015. TeacherLists’ findings also reveal that while middle school and high school lists are typically shorter than elementary school lists, they ultimately cost parents more. Middle school lists in 2015 will cost parents an average of $91.14 and high school lists will add up to $157.58. The increase is attributed to technology items like graphing calculators and iPads that are sometimes required at higher grade levels. The TeacherLists team analyzed over 300,000 lists this year to determine what parents are being asked to provide nationwide. 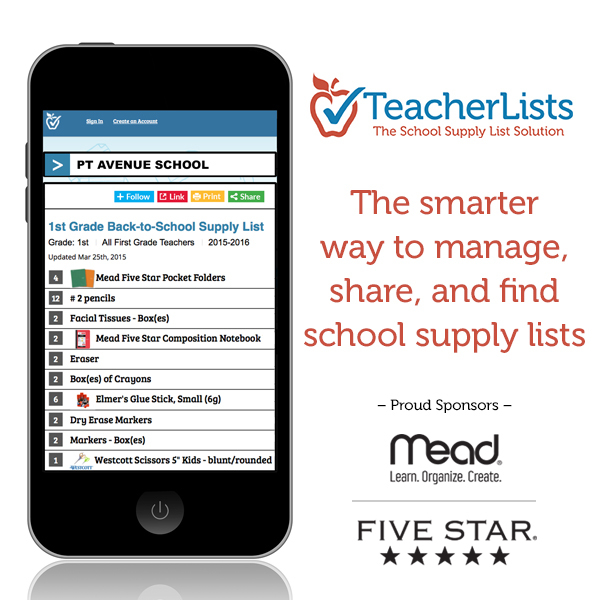 TeacherLists is the smarter way to manage, find and share school supply lists for teachers and parents, free-of-charge. After uploading a school supply list once, educators can easily update and link the list to a school or personal website. TeacherLists provides parents the freedom of accessing and finding the most updated school supply list, twenty four-seven. For more information about TeacherLists, visit http://www.teacherlists.com.